Make prepping, moving or serving your favorite meals and dishes easier with multipurpose silicone oven mitts and potholders made for holding hot dishware. Whether you're working over that hot stove to create a delicious holiday meal or you're cooking up a fervor on the backyard grill, it's important to protect your hands and other surfaces from heat or flames that can cause burns, scalds or worse. That's why we developed this Homwe Silicone Oven Mitts and Silicone Potholders set that comes with two mitts and two trivets perfect for daily kitchen and grill use. Thanks to this 4-piece set, you can worry a bit less by working over hot flames, ovens, stoves or grills, especially when pulling out hot pans, serving hot plates, or placing dishware on your nice new hardwood table. Get a grip on your pots and pans and keep your hands and your counters safe with Homwe today! Make prepping and serving food safer and easier with this all-purpose silicone oven mitts and potholders perfect for every kitchen or outdoor BBQ by clicking 'Add to Cart' above today. 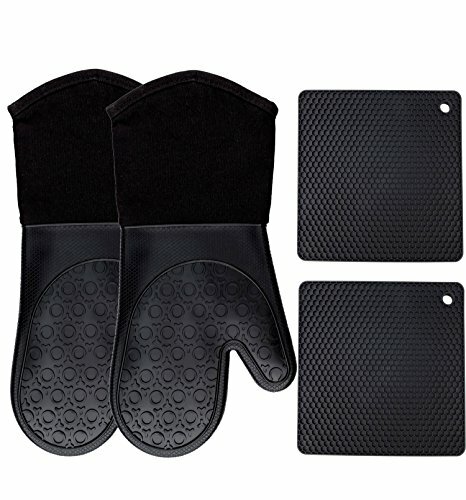 •Complete Kitchen Cooking Set - This unique accessory set comes with two insulated silicone oven mitts and two silicone potholer trivets measure 7" x 7" for better kitchen and grill use. •Heat-Resistant Silicone - Each piece is crafted with flexible, durable silicone, making them ideal for moving or holding hot pans, plates, utensils or dishware. •Textured, Non-Slip Grip - Gloves and the trivet both feature textured surfaces to improve your grip strength, control and stability over hot, heavy, or slick items. •Indoor & Outdoor Versatility - Designed to better protect hands from burns and countertops from scalds, this oven mitt and potholder set is great for all your meals. •Heavy-Duty Durability - These gloves and potholders are not only heat resistant, they're comfortable, flexible, and offer long-lasting, food-grade safe versatility.